Bruce Mahalski has joined forces with multimedia artist, Jeiko Despotovich to produce a range of limited edition art prints featuring some of the recent bone sculptures. The first print features Bone Gun#2 – the M16 replica – as well as labeling the individual skulls and bones used in its construction and the specifications of the original weapon. The first print is a trimmed A2 image on 220gsm satin matte paper and is signed by the artist (Edition of fifteen prints only.) They can be purchased for NZ$100 (plus $15 Postage locally or $30 overseas)by contacting the artist on this site. Only two are still available. 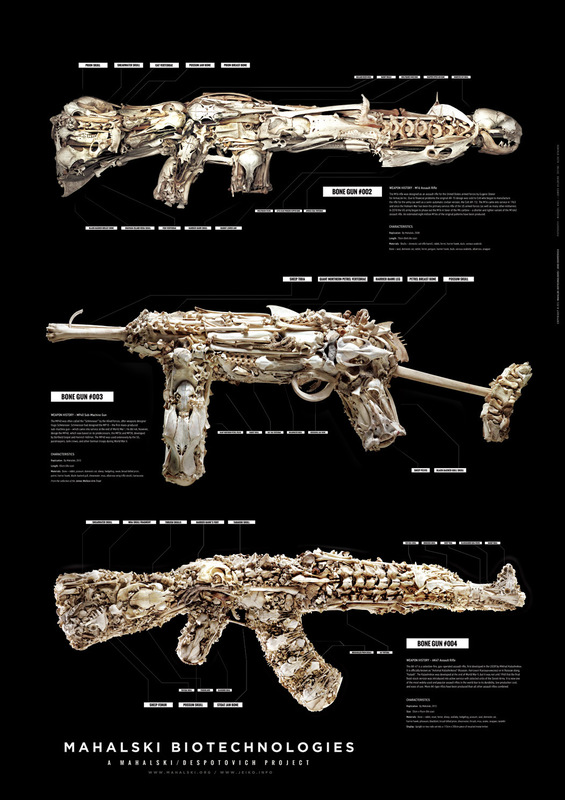 The second print features the three scale bone replicas of the M16, the MP40 (‘Schmeisser’) and the AK47 (‘Kaslashnikov’) and is covered in labels identifying the various bones as well as information about the replicas and the weapons themselves. It comes in A1 size on 220gsm satin matte paper and is signed by the artist. The edition size is 50 prints. Copies can be purchased for NZ$100 (plus $15 postage locally or $30 overseas)by contacting the artist on this site.